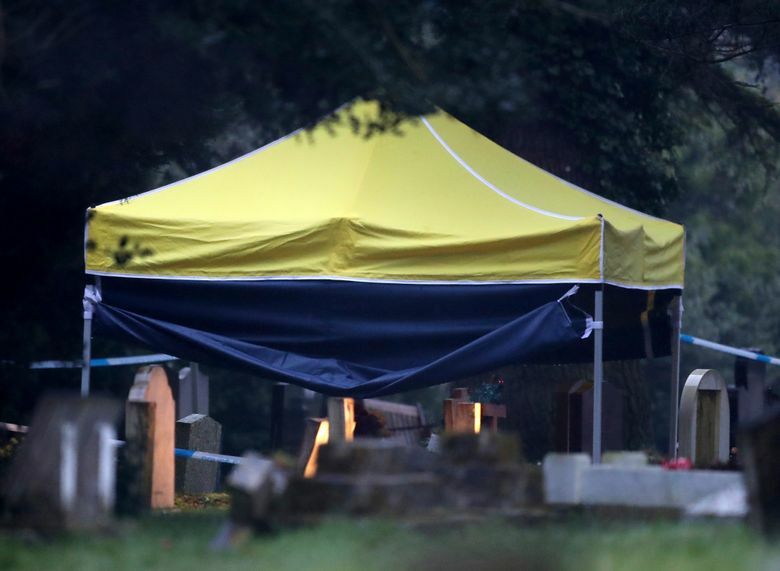 Forensic activities at the London Road Cemetery intensified speculation about the recent poisonings of Sergei V. Skripal and his daughter, but authorities provided no details, saying only that they had not exhumed any bodies. LONDON — British authorities investigating the poisoning of a former Russian spy, Sergei V. Skripal, and his daughter visited the graves of Skripal’s wife and son in the cathedral city of Salisbury, England, on Friday. Skripal’s wife, Lyudmila, 59, died in 2012 of uterine cancer, according to records from the National Health Service. His son Alexander, 43, died last year. Authorities did not provide details, saying only that they had not exhumed any bodies, but the forensic activities at the London Road Cemetery intensified speculation about the poisonings. Skripal, 66, and his daughter, Yulia S. Skripal, 33, were found unconscious Sunday afternoon on a bench outside a shopping center. Police said the two had been poisoned with a nerve agent difficult to produce outside a government laboratory, heightening suspicions that Russia had played a role. On Friday, army weapons experts and scores of troops were deployed to Salisbury to assist in the investigation. The 180 military personnel sent included the Royal Tank Regiment, Royal Marines, and chemical-weapons specialists and bomb-disposal units. Russia’s foreign minister, Sergey Lavrov, on Friday denied the government was involved in the poisonings but offered assistance in the investigation. A day earlier, a presenter on Russia’s Channel One news program struck a different tone, saying — without mentioning names — that the poisonings should serve as a warning to Russians considering betraying their country. In 2006, Skripal was convicted in Russia of being a double agent and secretly passing classified information to British intelligence. In 2010, he was pardoned, released from prison and sent to Britain as part of a spy exchange with Western agencies. The Skripal poisonings also affected some investigators, officials said. Detective Sgt. Nick Bailey remains in the hospital in stable condition. Ian Blair, a former commissioner of the Metropolitan Police, told the BBC that Bailey appeared to have been sickened when he went to Skripal’s house, suggesting that the nerve agent may have been released there.